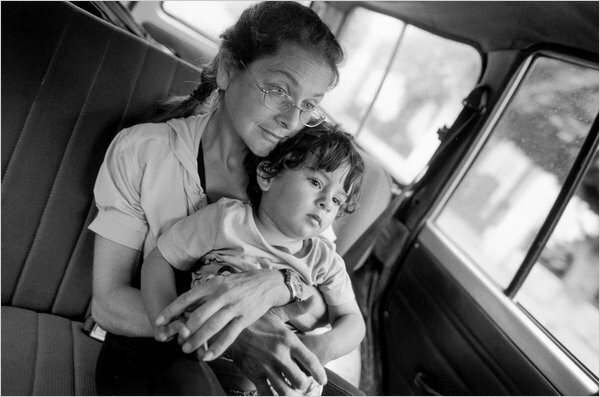 (above) Lori Berenson and her son, Salvador, in Lima, Peru. Photo: Mary Ellen Mark for The New York Times. Lori Berenson has always loved to walk. When she was a high-school student in Manhattan in the mid-1980s, she walked home at night from her job at Pasta & Cheese, on the Upper East Side, to the apartment where she grew up, on East 25th Street. When she began her prison sentence in Peru, in 1996, for collaborating with a terrorist group, convicted terrorists had to spend 23½ hours a day inside their cells. Even then, Berenson walked in the 6-by-9-foot space she and another woman shared -- two steps forward, two steps backward -- for hours. "People ask, what did you miss most?" she said in August, two and a half months after she was released on parole, having served nearly 15 years of a 20-year sentence. "This was definitely it." It was after dark, and we were taking a rapid, circuitous walk through a park that clutches the crumbly cliff tops in the Miraflores district of Lima, where Berenson and her 15-month-old son, Salvador, had been living since her release. (Berenson's parole requires that she remain in Peru until 2015.) They were sharing an apartment with a family friend and, temporarily, Berenson's parents, who were visiting from New York. Berenson had recently separated from her husband -- Salvador's father -- whom she'd met in prison while he, too, was serving a sentence for terrorism. Soon after his release in 2003, they married, and Salvador was conceived during a conjugal visit. The boy spent his first year of life with Berenson in the women's prison in Chorrillos, Lima. In the gusty winter darkness, bicyclists and skateboarders wheeled along paved paths that snaked among graffiti-carved cacti and fluorescently lighted soccer games. Berenson insisted we wait until dark to go out; since her parole, she has been hounded by strangers who scream obscenities or call her "assassin" and "murderer." Just that day, on her way back from the playground with her mother and Salvador, "this woman said: 'You're under house arrest! You should be in your house!' She was with a cellphone, taking pictures. I don't like going to the park, because people stare at you and make you feel as though you're not welcome." Berenson wasn't under house arrest, but she might as well have been; the media frenzy surrounding her release on May 27 meant that during her first 10 days of freedom, she never went outside. A horde of photographers stormed the car in which she was driven away from the prison -- three cameramen thrust themselves into the backseat; more jumped onto the roof, leaving dents; a TV van crashed into the back. Another gantlet awaited her outside her apartment building, surging against the surrounding gate with such pressure that it buckled. For many days, the press lingered outside, interviewing Miraflorans incensed at having Berenson in their midst. Such an outpouring of rage at a 40-year-old woman, mother to a toddler, who was convicted in her mid-20s of abetting a terrorist plot that never took place, is a measure of the degree to which Peruvians are still traumatized by the violence that convulsed their country during the years when the Shining Path warred with the military and nearly 70,000 Peruvians were killed. It also underscores the fact that terrorism, all but defunct in Peru for more than a decade, is still a hot political issue. In person, Berenson is an unlikely fulcrum for all this drama. 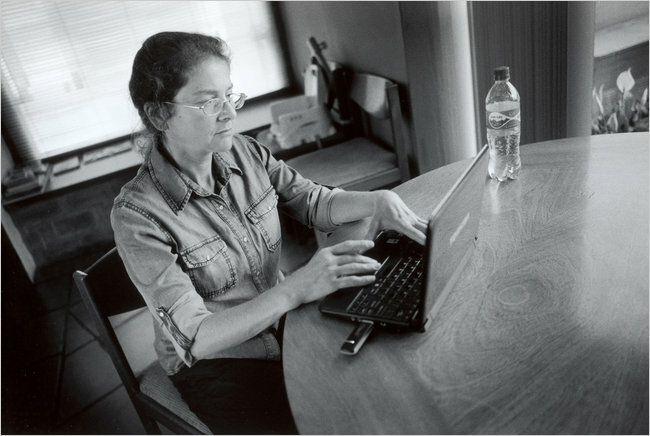 She is slight and mild-mannered, with wire-rimmed glasses, an inquisitive gaze and wavy brown hair that she often wears in a single braid down her back. She dresses simply -- often in jeans, occasionally dangly earrings. Her speech is polite and a little stiff, in the manner of both a native English-speaker who has lived much of her life in another language, and a person who resists self-revelation. When she's comfortable, a dry sense of humor emerges -- a willingness to laugh at her predicament. She is most forthcoming on general topics: Peruvian politics, the economy and its inequities. Personal questions she often greets with a hurried, "Yes, yes, yes," or "Oh, no, no," as if she were physically brushing the query away. You feel that she would go to almost any length to avoid exposing her emotional life to a relative stranger: deny its existence -- even forget it, as she appeared to when I asked, on our walk, what part of her early life she remembered as especially happy. "I don't know," she said. "I haven't thought of that." Berenson was first detained on Nov. 30, 1995, when she was 26. She and another woman were pulled off a public bus after leaving the Peruvian Congress building. Berenson had journalist's credentials and assignments from two American publications; the other woman, whom Berenson said she'd hired as a photographer, was the wife of Nestor Cerpa, a leader of the Túpac Amaru Revolutionary Movement, or M.R.T.A. Within hours of the women's arrest, police officers raided a house Berenson had rented with a male friend who was an M.R.T.A. member. (She had moved out before the raid.) The police engaged in an 11-hour gun battle with M.R.T.A. fighters who were holed up inside; M.R.T.A. members and one police officer were killed before the M.R.T.A. surrendered. The M.R.T.A. was a much smaller insurgent group than the dominant Shining Path, and historically less violent. But on the top two floors of the house, which Berenson had sublet to another M.R.T.A. leader, the police discovered a large cache of weapons and ammunition, along with evidence of a plan to forcibly seize the Congress and hold its members hostage. Berenson claimed she was innocent: she had known the people by different names, she said, had no idea they were M.R.T.A. members and had never visited the top two floors of the house after subletting them for what she thought was going to be a school. Five weeks after her arrest, on Jan. 8, 1996, Berenson was taken to a small auditorium in the headquarters of Dincote, Peru's antiterrorist police, and presented to the press. Her performance was indelible: she took the stage bellowing in Spanish, hands clenched at her sides, long dark hair tumbling down both sides of her face. After denouncing suffering and injustice in Peru, she denied that she was a terrorist by shouting: "In the M.R.T.A. there are no criminal terrorists. It is a revolutionary movement!" -- words that, to Peruvian ears, amounted to a confession. She looked scary: big, ungoverned and enraged. To this day, clips from that 15-year-old tirade are part of any news story about her on Peruvian TV; stills from it, in which she appears to be baring her teeth, appeared on the front pages of Peruvian newspapers when she was paroled. Her father told me ruefully: "Forty-four seconds, and it ruined her life. It doesn't take much." (below) On Parole Lori Berenson at the apartment where she is living in Lima. The conditions of her parole require her to remain in Peru until 2015. Photo: Mary Ellen Mark for The New York Times. Recalling her mind-set that day, Berenson told me: "I was indignant about the whole judicial process. The lawyer had already told me they were asking for 30 years, no parole. It was like: I have nothing to lose. I saw such inhumanity, particularly in the case of the people who were wounded. And thinking that no one would ever hear about it. I just said, Well, I know someone will listen to me if I say something. That was the most naïve and stupid thing I did, was thinking that by saying that, it would be helpful." It was helpful to Fujimori, who got credit for locking up a dangerous American who now personified, in the public mind, the irrational violence that had racked Peru. Cynthia McClintock, a professor of political science at George Washington University who has studied Peru since the 1970s, told me: "That she was going to be behind bars served Fujimori's purpose of highlighting the success of his intelligence work, and the government's judicial process. They did a very good job of showing the activists in these movements in their worst way." It was also helpful to the prosecution, which upped its request from 30 years to life in prison without parole. Three days later, Berenson was convicted of treason against the Peruvian State for being an M.R.T.A. leader and financier. She was sentenced, along with 22 others, by hooded military judges -- then a customary procedure for dealing with accused terrorists. Her parents were not allowed to be present. It's hard not to wonder -- as people close to Berenson do -- whether things might have unfolded differently for her had she cowered, rather than shouted, before the press, or betrayed even a modicum of the panic and despair most people would have felt in such circumstances. But anyone close to Berenson knows that she would never expose herself in that way -- indeed, her toughness may extend to not even perceiving her own vulnerability in the way most people would. "When they sentenced me to life, I started cracking up," she told me. "It might have been sort of a nervous reaction. They started saying things I supposedly had done, and it was like, What? What's going on? It was insane." A few days later, she was transferred with a group of about 40 prisoners to the infamous Yanamayo prison in Puno: unheated, at an altitude of 12,000 feet. They were flown in a cargo plane with their heads covered, guarded by armed soldiers, then moved onto a bus. "I don't remember it being particularly scary," she told me. "My logic at that time was different: you're put in this bus, you can't really hold on because you're handcuffed behind your back, and you need to hold on because you might fall on your face." She chuckled, remembering. "And so that was your concern." Not perceiving your own vulnerability is a bit like not perceiving physical pain; it may allow you to tolerate extremes that would crush other people -- as Berenson certainly has -- but it can also hinder your ability to calculate personal risk. For all of her emotional self-protectiveness, at critical junctures Berenson has been unwilling, or possibly unable, to perceive the dangers incurred by her words or actions. "My coming here, in retrospect I can say it wasn't the best decision," she told me, with a wry laugh, "but I was fascinated by the diversity of cultures and peoples, and I guess I didn't see the consequences of not just coming here but getting involved." Berenson's emotional opacity has made her the locus of myriad contradictory visions: to many Peruvians, she is chilly and unrepentant; to Americans who worked for her release and visited her in prison, she is brave and stoic -- almost saintly. But what I heard most often, especially from women, was that Berenson had reminded them of themselves: young, passionate, risk-taking. Robin Kirk, director of the Duke Human Rights Center, who worked in Peru as a journalist throughout the dangerous upheaval of the 1980s, said she identified with Berenson but also -- as a mother -- with Berenson's parents: "Your bright, adventurous child goes off, and you have to be supportive, of course, but what kind of things are going to happen to change their lives? For me, it was all for the better; I would never have traded that experience in Peru. And I had good luck." Lori Berenson had a middle-class Manhattan childhood. Her parents were professors: Rhoda taught physics at Nassau Community College; Mark taught statistics at Baruch College. Her sister, Kathy, now a research psychologist, is two years older. When Lori was in kindergarten, the family moved from Queens to an apartment in the East Midtown Plaza housing complex, in the East 20s (her parents still live there), and Lori went to Public School 40 and Junior High School 104. The Berensons were neither overtly political nor religious. "I'm not from a political family at all," Berenson told me. By all accounts, Lori was a busy, sociable, highly musical child. She played the lead in junior-high productions of "Annie" and "Jesus Christ Superstar." An organized, diligent student, she was the sort of kid who resists telling her parents exactly what she's up to. "They come home at 3 o'clock; 'How was your day?' " Rhoda recalled. "For Lori, it was: 'It was great. I'm leaving.' " She continued, "Quite honestly, she does take after me." All three female Berensons are profoundly private -- to an extent that seems quaint in our self-exposing era. In October, Kathy explained to me why she preferred not to provide childhood anecdotes about Lori: "To some extent, my private memories of me and my sister as a child are all I have left that hasn't been already given over to this traumatic series of events," she said, with visible discomfort. "So it's both my private nature and my sense that we've already given it all away." Mark Berenson, Lori's father, is the vivid exception: effusive and mercurial, prone to occasional exaggeration and oversharing, he routinely embarrasses his wife and daughters. The writer of many textbooks on statistics and a self-professed workaholic, he berated himself for not having listened enough when Lori might have wanted to talk as a child. "I was not a good parent," he told me, over his wife's protests that he was better than most men his age. "I called for them at school, I took them home, but they were talking, and it went in one ear and out the other." According to Mark, when Lori left for Central America, she made him a mixed tape that began with Peter, Paul and Mary's "Leaving on a Jet Plane," followed by Harry Chapin's "Cat's in the Cradle" -- that classic ballad of parental neglect. "She zinged it to me," he said. A love of animals prompted Lori to become a vegetarian by age 8 -- in 1978 -- with such well-reasoned vehemence that her mother and sister soon followed suit. At 12, she began spending her summers in the Hamptons as a mother's helper, the first of many jobs she held, and saving serious money. In 1980, when Lori was 11, three American nuns were murdered in El Salvador. "That stayed in my head," she told me. "I remember hearing about it, seeing a movie about it, saying: 'Wow, it's terrible, it's not fair. They were helping poor people.' I wanted to be a nun. Of course, you can't do it if you're not religious. You adopt another kind of religion, I guess, and that was sort of what I did." Berenson is not a creator of romantic self-narratives. When she speaks of adopting another kind of religion, she means that at M.I.T., where she arrived in 1987, after graduating from LaGuardia High School of Music and Art and Performing Arts, she had a conversion experience. She began working for Prof. Martin Diskin, who was doing research on the policies of granting political asylum to refugees from Nicaragua, El Salvador and Guatemala. She learned that those who received asylum were likely to be the ones fleeing groups that the United States opposed: the Sandinista government of Nicaragua, or the guerrillas fighting in El Salvador. "The others would get sent back to be killed, even though they had been tortured," she told me. "Why wouldn't you give someone who's being pursued refugee status? Politics. My awakening to the world." Berenson spoke of this revelation with a forceful clarity I rarely heard in discussions of her personal experience, which she tends to minimize. Her political views, expressed in periodic statements from prison that her parents posted on their FreeLori.org Web site, haven't measurably changed over the years; on the contrary, her discovery of a world built on oppression, exploitation and imperialism has -- in Berenson's view -- been ratified by her experience in Peru. "I realized that behind suffering was politics. It wasn't just like, Oh, these people are poor and they're destined to suffer. No. There are interests behind that -- political, economic -- in having a social class be relegated to dying in misery, and being exploited, and being harmed, and suffering repression." At M.I.T., Berenson lived in co-ed housing off-campus. Her roommate, Kristen Gardner, still a close friend, recalled: "She had a great sense of humor, she played the guitar. We both had a lot of friends who were involved in politics. Neither of us were big partiers. It was very down-to-earth." During spring break of that freshman year, Berenson joined an interfaith religious delegation to El Salvador. "When I got there, there was something about it that I just loved," she told me. "I loved the hills. I've been a city person all of my life, and saying, Wait a minute, this is a different world, and I want to be part of this world." She lasted only one more semester at M.I.T. "In high school, I was a dedicated student," she told me. "I was excessively disciplined. And I just decided it was all wrong -- my vocation was something else." Mark Berenson recalled her decision with a lingering air of helplessness. "What could we do?" he said. "She had her own money. We taught her to be independent. So we said: 'O.K. Go.' Hoping that it wouldn't be a horror." After Christmas break of her sophomore year, Berenson went to El Salvador for three months with a student delegation. Back in the United States, she worked briefly for the Committee in Solidarity With the People of El Salvador, or Cispes, in New York and Washington. "And then someone asked me if I would be willing to work with an F.M.L.N. representation in Washington." The F.M.L.N., or Farabundo Martí National Liberation Front, is now the ruling party of El Salvador; its candidate was elected president in 2009. But in 1989, when Berenson took the job, the F.M.L.N. was an aggregate of five Marxist guerrilla groups locked in a long civil war with the oligarchy of El Salvador. In early 1990, Berenson moved to Nicaragua to work for the F.M.L.N. there. The work was mostly secretarial, but she also had contact with the Salvadoran refugee community. When a cease-fire was declared and peace accords signed in 1992, Berenson moved to San Salvador and became the secretary of one of the F.M.L.N. 's commanding generals, Salvador Sánchez Cerén, a signer of the peace accords (he is now vice president of El Salvador). Though she wrote letters home and made occasional visits, she was distant from her parents during her years in Central America. They never knew her exact role with the F.M.L.N. until after her arrest. Close proximity to a successful guerrilla war, peace negotiation and ensuing political legitimacy must have been a heady experience for a person of 22, but Berenson would acknowledge this only theoretically: "It was feeling like I was part of a project that was going to help resolve problems of inequality -- social, economic." As I puzzled over her reluctance to evoke that triumphant moment, I found myself recalling her sister's reason for not divulging childhood memories: that in giving them away, she would diffuse their private power. By 1994, two years into the peace, Berenson had grown unhappy. She married a Salvadoran economics student, but the marriage quickly foundered. "In civilian life, the urgency wasn't the same," she told me. "Since I had dedicated 12 hours a day -- almost 24 hours -- exclusively to a project that was positive, once I stopped having that level of dedication, I felt as though there was something wrong." Berenson left El Salvador in October 1994, traveled in South America and arrived in Peru in November with plans to stay. The morning after our walk in August, under the depthless white sky that seems to hang over Lima in winter, I visited Berenson in her apartment, on the corner of a quiet residential street. Parolees are expected to live with family; because Berenson is separated from her husband, her friend Marie Manrique -- Salvador's godmother -- is serving that function. Berenson was supposed to have moved into Manrique's apartment in another neighborhood, but shortly before her release, the antiterrorist police came to the home of Manrique's landlord and asked whether she knew that Lori Berenson would be moving in. The landlord hadn't known, and she threatened to evict Manrique. There was a last-minute scramble for new housing; a succession of landlords refused to have Berenson under their roofs. The current apartment, which came furnished, is more expensive than they'd like (Berenson's parents pay the rent), and a sixth-floor walk-up is not ideal for a toddler and a stroller, but they were lucky to get it. Berenson and Salvador share a bedroom beside a kitchen alcove, where a flight of steps leads down to the front door. Berenson hadn't fully unpacked, and several fat woven-plastic bags with black prison markings were barricading the top of the stairs to keep Salvador from tumbling down. He settled for tossing a small car over the bags, listening with satisfaction as it ricocheted down the stairs and smiling impishly. He was 15 months old; a sturdy, sweet-faced boy with dark curls and a fierce attachment to his mother, whom he liked to keep in sight at all times. Mark and Rhoda Berenson were getting ready to take Salvador to the park, as they did each day. Mark is tall and boyish, with a clipped gray mustache and beard; Rhoda is tiny and serene, clearly the anchor of the two. Together, they form a kind of living encyclopedia of their daughter's legal history, finishing each other's sentences as they narrate a litany of close calls, near misses and what ifs. (What if they'd hired the Miami lawyer they refer to as Mr. Slick, who cost $60,000? What if Lori had gone to Oberlin instead of M.I.T.?) Since Berenson's arrest, they'd devoted themselves to her release, both retiring early from their jobs and, for a time, renting a Washington office to lobby members of Congress. (In recent years, they accepted new teaching positions.) During the four months in 1998-99 that Berenson spent isolated at Socabaya prison near Arequipa, her parents alternated visits every two weeks: flying to Lima, spending the night on the airport floor, catching another flight at dawn. In fact, Berenson's greatest source of conflict with her parents arose from her wish that they would do less. At a certain point, she told me, "I just said: 'To hell with it. It's over. We lost.' " She begged her parents to suspend their efforts. "It's very painful to see them wasting their lives away," she said. "And it just created an expectation of something changing when I knew nothing was going to change." From the start, the Berensons' chief hope was that the United States government would effect their daughter's release. Former Attorney General Ramsey Clark, who in 1989 worked with the State Department to negotiate the freedom of a young American woman in El Salvador under uncannily similar circumstances, said the State Department's efforts fell short in Berenson's case. "The government in Washington didn't act with alertness in the way that a government committed to protecting its own citizens ought to," he told me. But Dennis Jett, who was the United States ambassador to Peru from 1996 to 1999, vigorously rejected the notion that the State Department could have done more. "What leverage do we have over Peru? "he asked. "I think this is a colonial, somewhat-racist mentality that these countries are always wrong, and all we have to do is apply pressure on any underdeveloped country" and it will deem an American prisoner innocent. As Mark and Rhoda Berenson prepared to leave for the park with Salvador, he realized that his mother wasn't going along and began to cry for her. Berenson hugged him tightly at the top of the stairs and kissed him goodbye. Her tenderness with her son is a striking contrast to her usual reserve, and his wish to cling to her was made more poignant by the fact that her parole was in jeopardy. The state prosecutor had appealed it within days of her release in May, challenging whether she'd served enough time (prisoners can reduce their sentences through work or study, and Berenson had done so), as well as whether her psychological reports -- which must affirm a prisoner's rehabilitation -- were credible. If her parole was revoked, she would have to return to jail for five more years. By law, Salvador could remain with her until age 3, but by now he'd grown used to running freely in the park. "He's had a taste of life outside of prison," she said. "I don't think it's going to be easy for him to go back." Salvador could return to New York with his grandparents (as he would have to in nearly two years), but he was still so small, and nursing overnight. "I'm tense, and I'm very tense with him," she told me. "I feel bad about it." She had been trying, subtly, to prepare Salvador for a possible future separation. "When we're alone together or he's going to sleep, I tell him that I love him and I'll always love him, but I may not be with him physically always," she said. There was an enforced intimacy about life in the Chorrillos prison. Berenson was among women from the M.R.T.A., some of whom she'd known from other prisons, and likened to a big family. Her history of good behavior meant that she was allowed to move freely between her cell and a communal courtyard. "I used to be with Salvador from 6 a.m. until about 7 at night, and then sometimes we'd get together to watch the news with other inmates from 7 to 8," Berenson told me. "I'd take him into the cell and close the door, and it's like a playpen. I could make his food or mush his banana." But when she needed to wash clothes or clean the cell, she would avail herself of "aunties," fellow inmates who enjoyed caring for Salvador. "They'd give him his dinner and a bath, and I would join them at 8:30 or something, depending on how many clothes I had to wash."
Berenson says she met Salvador's father, Aníbal Apari, at Yanamayo prison, where Apari was transferred as part of a 15-year sentence for being an M.R.T.A. militant. Now a lawyer who often litigates on behalf of prisoners (despite their separation, he was defending Berenson's right to parole), Apari is a rangy, thoughtful man, easily moved to laughter. When I spoke with him in his office in December, he affectionately recalled hearing Berenson's notorious press presentation while in another prison, on a contraband radio. "Of course everyone said, 'Well, now she's sunk,' " he told me through a translator. "I only heard her; I didn't see her. I thought it was courageous, a bit ingenuous." When Apari was moved to Yanamayo prison a few months later, he spotted Berenson on his second day. Prisoners for terrorism were housed apart and separated by group. He was able to get someone to deliver her a note wrapped in Scotch tape. She sent back a note of her own. "When you're in prison, the only way you can show affection is through gestures," he said. "The authorities allowed us once a week to exchange presents with the women. Some people sent sweets or candies. I sent a yellow scarf to Lori. It's cold up there, of course. I saw her with my scarf on -- that's a sign. There was a spontaneous chemistry between us, a natural feeling." They overlapped at Yanamayo for a year; then Berenson was moved to Socabaya prison. They communicated by mail from that point on; Apari would send a letter via his father in Chile, who would send it to Berenson's father in New York, who would send it to Berenson in Peru. The cycle took about two months. When Apari was released on parole, in 2003, they were married while Berenson was at Huacariz prison. Berenson said, "The idea was that once we were both free, we would celebrate it in a different manner." Apari was allowed two conjugal visits each month, and for the first four or five years, he visited often. Berenson wouldn't discuss the details of why the marriage didn't work out, but she told me: "The last couple of years, he came less. I knew there must be a reason for that." In their final year, Apari visited only twice, and on one of those visits, Salvador was conceived. The couple separated before their son was born. In retrospect, Berenson said, she wasn't surprised that the stresses of prison proved too much for them. "We were far away," she said. "A lot of not being able to express emotions for a long time. It's very common." At the mention of the separation, Apari grew sober, uneasy. "It doesn't make me happy," he said, "but these things happen." Apari became involved with the M.R.T.A. as a young man through his Lima neighborhood, long before Berenson arrived in Peru. He stressed what I'd heard from others: that the group had come into existence in the early 1980s largely to oppose the neo-Maoist Shining Path. Robin Kirk, who covered the Shining Path as a journalist, told me: "The Shining Path, especially for Latin America, was absolutely new. It was like a cult. The Khmer Rouge in Spanish." Abimael Guzmán, a philosophy professor, formed the group in 1970 and served as its prophet and commander in chief, later directing his militants to kill anyone who rejected their principles or failed to do their bidding. There was a scant social program; the vision was simply to wipe out the past and let the future take care of itself. "In a way, the M.R.T.A. wanted to show that you can have an armed struggle in a different way," Apari told me. "More like the Sandinistas, like what happened in Cuba, where politics were the most important thing, and weapons were simply a means. When confrontation was impossible to avoid, it should be done respecting the adversary." This formula proved successful in Latin American countries in addition to El Salvador; the current presidents of Brazil, Uruguay and Nicaragua are all former guerrillas. But the violent unreason of the Shining Path made Peru a different case, and toward the end, many say, the M.R.T.A. began to emulate its more cutthroat rival. The Peruvian historian Nelson Manrique told me, through a translator: "A lot of the M.R.T.A. leaders were sent to prison, and those who took the lead were the more-militant leaders, which gave it a different sort of character. They said: 'We're acting like little nuns. We're not growing, and the Shining Path, which is brutal, is growing.' "
Berenson's life sentence was nullified in 2000 by the Fujimori government, which stated that new evidence had come to light that she was not an M.R.T.A. leader. She was granted a new civilian trial in 2001, although much of the evidence against her was the same. Throughout that three-month trial, which was televised, Berenson asserted her innocence, insisting that she hadn't known her various associates were M.R.T.A. members yet also refusing to condemn the group. While this time she was absolved of being a member of the M.R.T.A., she was still convicted of collaboration: renting the house for the group and entering Congress in the guise of a journalist, with the intention of assisting in a takeover. She received a new sentence of 20 years, including time served. Today, while Berenson refuses to discuss in detail what happened during the year she spent in Peru before her arrest, she does admit that she knew her associates were M.R.T.A. members (without knowing their real names -- a customary practice in subversive groups) and willingly helped them to rent the house. "It might not have been intentional, but the bottom line is: I did collaborate with them," she said. "Shortly before I was detained, I had the sense that things were out of my control," she told me, referring to activities in the rented house. "I didn't imagine what it was, the magnitude of it. But I knew enough to have been able to say, I should get out of this." Instead, she said, "I avoided the situation. I rented another place. Very head in the sand." What she never knew, she still insists, was that weapons were being amassed in the house, or that violent action was being planned. She maintained that her visits to Congress were genuine journalistic explorations. "At that time in Fujimori's dictatorship, Congress was the only place that there was some sort of democratic process." She called the notion that she was casing the building for a takeover "ridiculous," since anything she might have seen there was public knowledge. No one I spoke with in Peru seems ever to have believed Berenson's original claim of total ignorance, and such an obvious untruth may have been self-defeating -- not just legally, but by further damaging her image. When I asked Berenson why she had hewed to that story during her civilian trial, she told me it was because she was innocent of the charge of posing as a journalist for the purpose of seizing Congress. More critically, had she admitted any inside knowledge of the group, she said, the Fujimori government would have pressured her to implicate those around her. "They wanted me to say: 'I condemn them. They are horrible people. They're terrorists who obliged me to do this.' Look, I didn't believe in social justice since I was young to get up there and blame someone else for my own wrongdoings. Maybe I was naïve, maybe I was convinced of things that weren't true, and I intentionally avoided dealing with reality. But no one put me at gunpoint." When I pressed her on whether the M.R.T.A. trapped her, she responded, "I was willingly trapped." The days I spent with Berenson in August were marked by the drumbeat of her approaching parole hearing, scheduled for Aug. 16. The day before, while her parents took Salvador to the park, she came out to lunch with Marie Manrique and me in a neighborhood far from Miraflores -- the first time she ventured to a restaurant since her release. Manrique, who is half-Peruvian but grew up in the United States, is Berenson's age, open-faced and garrulous; she worked for years in human rights and is now studying political journalism. She first read about Berenson in 1996 and began visiting her in prison a few years later. I asked how her Peruvian friends felt about Manrique's making Berenson's parole possible by living with her. Reactions were mixed, she said; she'd just received an e-mail from a friend who referred to Berenson as soberbia, meaning "haughty." "You know, I can't win," Berenson said unhappily. "I'm quiet, I don't joke around. I'm just like that." "Here's a question," Manrique said. "You didn't cry." She meant that Berenson had never once broken down in public -- a fact Peruvians saw as proof of her coldness and lack of remorse. "I've always been a very private person," Berenson said. "I sometimes have cried in front of people -- I haven't intended to -- it's something I'd definitely avoid doing. For dignity." Berenson told us that on the day she left prison last May, she avoided saying goodbye to her fellow inmates -- to women she regarded as family -- purely to prevent being exposed in an emotional state when she appeared before the phalanx of press that was waiting outside. "I said goodbye from the door, and they said, 'Oh, you're coming back,' and I said, 'No.' "
Manrique suggested that letting her emotions show at tomorrow's hearing -- even just a little -- would only make her more sympathetic. "They would just make fun of it," Berenson said. "I give that to you," Manrique said. "Some press would be like, 'She's faking.' But then other people would be like, 'O.K., there's something under that hard veneer, and it's a person that's worried about five and a half more years in prison.' If something cracks for a few seconds, it's O.K." Berenson considered. "For me, it would be much harder to crack and be able to control it," she said. At the hearing, she seemed relaxed. She wore a pair of gray slacks with a matching jacket and silver hoop earrings. It was a small, crammed courtroom. Berenson was allowed five minutes to speak, during which she apologized if her presence in Peru contributed to violence and expressed her wish to be with her family and to raise her son. Back at the apartment that evening, she was upbeat. "I think I did it better than I've ever done before," she said. "Public speaking is not my strong point." Although the three judges would have 15 days to render a decision, Berenson had already begun packing; she felt that the decision would come fast and would probably go against her. Like virtually everyone I spoke to, she believed that the furor around her parole had been politically engineered (her address was printed in newspapers and broadcast on TV) and that politics would most likely land her back in prison. "Her release fell into the lap of the reactionary right in Peru, and it was like a gift from Santa Claus," Jo-Marie Burt, an associate professor of political science at George Mason University, told me. "What they try to do is manipulate the fact of Lori's release, use it politically to discredit the judiciary, which is in the process of prosecuting a handful of members of the armed and police forces for gross abuses of human rights." These forces are believed to be responsible for roughly 45 percent of the nearly 70,000 killed over two decades of conflict. I left Berenson's apartment that night wondering whether she was being alarmist. But less than 48 hours later, she and Salvador were back in jail; because of the last-minute change in Berenson's housing, the police had inspected the Miraflores apartment after the court papers had been filed. Berenson would have to remain in prison until the technicality was addressed. Then, assuming that she was paroled again, another hearing would be scheduled to decide the issues. Berenson turned herself in at the U.S. Embassy; the press was tipped off and mobbed her on the way to a holding cell. Carrying Salvador, she stepped from a car into an aggressive throng of cameras, all of which captured his panicked tears and Berenson's visible strain as she tried to shield him and push her way to the door. Berenson and Salvador were still in jail two months later, in mid-October. The clerical problem had been quickly solved, but the state prosecutor was trying other legal maneuvers to prevent her from being paroled again. Salvador had been running a high fever and was on antibiotics; he wept and clung to Berenson when she tried to leave him with the woman in the next cell while she went to speak briefly with the prison doctor. She'd been having bouts of vertigo -- a recurrent, undiagnosed problem. Since her return to jail, it had been so severe that she'd had to crawl sometimes to keep from falling. She and Salvador were sharing their cell with another inmate; the bottom bunk, where they slept, had sheets decorated with lions, birds and zebras. The front wall of the cell was bars draped with linens for privacy. A single fluorescent bulb hung from the ceiling, but natural light came through frosted hallway windows. Clothing hung from hangers attached to loops of string suspended from the ceiling. In the corner opposite the bed was a kind of stall that seemed to be both toilet and sink; there was a hole at the bottom and two wedges on which to place your feet. The water ran cold, but the prison would provide warm water to bathe the baby. After returning with Salvador from the doctor, Berenson tucked him into his stroller under a blanket that said, "Te quiero mucho," and squatted on the orange concrete floor to read him Dr. Seuss's "Mister Brown Can Moo!" Then she reclined the seat so he could lie back for his nap and pushed him into the small, dusty outdoor area populated by moth-eaten-looking doves. Berenson walked back and forth, pushing the stroller, for more than an hour. Certainly prison life had improved since Fujimori's reign; for the first year she was at Yanamayo, Berenson was not allowed a single visitor. After that, she could see her family for only a half-hour through a double layer of mesh that made them hard to see and impossible to touch. Prisoners in for terrorism weren't allowed music, radios or any media -- they were utterly cut off. In Yanamayo, the guards often withheld water; inmates blocked up the drains of the prison yard during storms so they could collect the dirty rainwater. Berenson joined other prisoners to protest these conditions with hunger strikes, but now she underplayed the hardships and spoke warmly of the community: singing together; calling out chess moves in virtual games; the euphoria of someone's being released. During this time, Berenson was managing a bakery in the Huacariz prison, in Cajamarca, supplying the jail with bread and sweets. "There is some satisfaction of doing something with your hands: it begins, it ends, you clean up and it's gone," she said. But in retrospect, she seemed to regret her utter commitment to that job. "It was all day and sometimes all night. I think I got so absorbed in the whole thing, I just felt time was passing in vain. I could have done other things -- reading, writing." Recently, she enrolled ?in an online translation course at New York University and, with Manrique's help, was managing to keep pace from jail. As for her broader goal, it was still unclear. "I'm not going to have anything to do with a violent organization," she told me, "but that does not mean that I accept the status quo; I have to do something about it." Berenson was granted parole a second time -- still contested, and therefore conditional -- and released from jail on Nov. 5, 2010, two and a half months after her reimprisonment. She and Salvador made a quiet return to the Miraflores apartment, without the uproar of the last time. When I visited the next month, in early December, the sun was finally shining and the heavy, gray waves below the Miraflores cliffs were studded with surfers. When I arrived at Berenson's apartment, after dark, she seemed harried and worn out. She was still awaiting a date for her next parole hearing. Salvador was recovering from the croup, and her vertigo was so severe that day that she was afraid to bathe him without someone nearby. Her parents had gone back to their jobs in New York, and she was grappling with the problem of trying -- without child care -- to create some kind of routine. She'd had fewer confrontations outdoors, she said, but she seemed haunted by some recent ones. A woman said, both to Berenson and her father, on separate occasions when they were with Salvador: "Watch after that kid. Something is going to happen to him." Another time, a woman with two dogs called Berenson "garbage." "She came up behind me and gave an order to the dogs, and they were put on the alert. Salvador was on the ground, so that really bothered me. She started yelling: 'Why are you in this park? You should be embarrassed to be in this park.' "
I sat in the living room while Berenson bathed her son in a deep bathroom sink. He was cranky and fretful. ''Qué quieres, bebé. . .?" she asked him gently. She dried him off and dressed him in a diaper and pajamas, and Salvador lay back in her arms on the couch, clutching a handful of her hair as he drank his bottle and began to drowse. Berenson carried him to their bed and tucked him in. Mother and son seemed a lonely pair that night, in a dim apartment, surrounded by a city she believed was hostile. "I was much freer in jail, in a certain way," she said. "I wasn't ostracized. Is there any way I would ever be able to function in this country? Or have they created a situation such that the only place they want me to function is in jail?" On Jan. 24, after another hearing before three judges, Berenson's parole was sustained; by law, she must remain in Lima until 2015, at which point she must leave the country forever. The decision is final. The press reaction was surprisingly muted, as if the paroxysm of her first release and return to jail with Salvador had drained it of energy. Last month, about three weeks later, I spoke to Berenson via Skype. It was summer in Peru, and she'd cut her hair to shoulder-length. There was crashing in the background; Salvador was throwing things and crowing joyfully. Berenson seemed more forthcoming and ready to laugh. The harassment had subsided enough that she'd started taking long walks around Lima with Salvador in his stroller. "As I become familiar with it, I find it more livable," she said of the city. "It's incredibly huge. And it's quite pretty." It was hard, she said, to shake off the dependent state of being a prisoner. "I'm asking Marie for help because I don't realize that I can just deal with it," she said. "I think most Peruvians who were in jail go out to their families, their friends. My social base in Lima is basically Marie. It's not rebuilding my place in society -- it's building it from scratch, constructing absolutely everything." In the 15 years Berenson spent in prison, her peers have moved from early adulthood into middle age. "The world has changed," she told me in August. "Internet, giant malls." Technologically, she's catching up, and has grown comfortable using e-mail and Skype. But at 41, she is still grappling with the fallout of youthful choices that have ended badly: her vocation; her marriage; her love of Latin America. The passion that fueled her move there seems to have left a kind of void, and beyond the need to support herself and her son, her future remains a blank. Of course, Berenson's future won't really be her own until her parole ends; for now, she is raising Salvador alone in Peru, with limited options. If she ever feels despair or defeat at these conditions, she wouldn't show it -- not at 26, with a life sentence in front of her, and not now. Her capacity to absorb fear and discomfort is partly what has saved her -- and also, most likely, what got her into trouble in the first place. But this is speculation; Berenson resists such storytelling, leaving the rest of us to our own devices in trying to unlock the mystery of her biography. What she can't elude is our desire to do so: a notoriety she has sustained, uncomfortably, for most of her adulthood. "I am always conscious," she said, "of who I am."